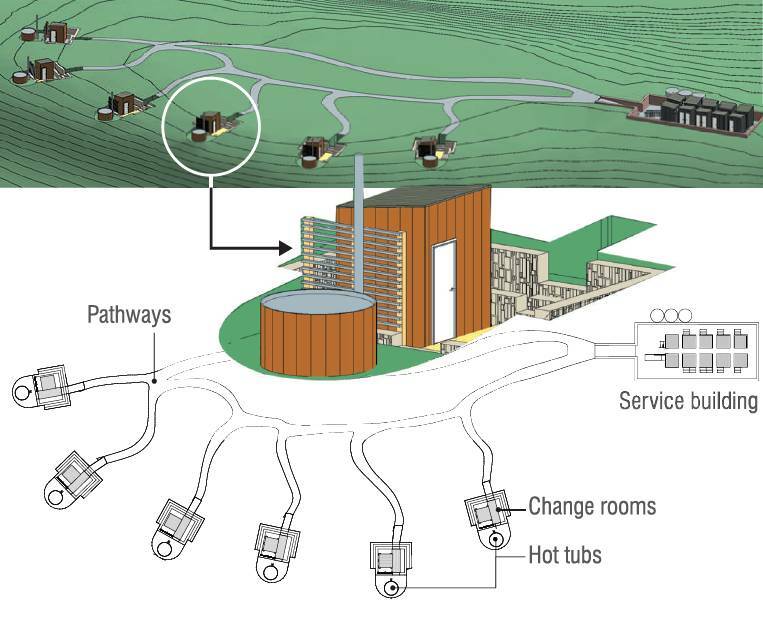 A small hot tub complex could soon be on the way for the Maungawera Valley. A certificate of compliance has been sought by Heron Investments Ltd for the establishment of a commercial recreational activity and facility containing six wood-fired hot tubs and change rooms, a cluster of 10 small buildings to be used as toilets, storage and site office, and three water tanks, on its 114ha Camphill Rd property, near Albert Town. About 976cum of cut and fill earthworks would also be undertaken, to create the platform for the tubs, buildings and water tanks. The directors of Heron Investments are Rik and Juliet Deaton. They have owned the property since 1991. Mr Deaton said on Tuesday the project was ''really exciting''. Saving the land from eventual urbanisation was a large reason behind the project, he said. In the application, prepared by planner Carey Vivian, of Vivian and Espie, it was said the maximum number of people involved in the activity at any one time would be 12, made up of 11 guests and one staff member. It was proposed that clients would be picked up from Wanaka surrounds by minivan and driven to the site, which would be accessed from an existing crossing on Camphill Rd. Limiting the number of people would mean the application would comply with the policies and rules of the Queenstown Lakes District Council's Operative District Plan and Proposed District Plan, and would therefore not require a resource consent, Mr Vivian said. Mr Vivian said the point of whether the initial six hot tubs would or would not require a resource consent was still being debated with council. Resource consent would be applied for at a later date to add three further hot tubs, in order to make the facility economically viable, he said.